Tarot cups are essential components in a tarot reading. They basically represent the element of water and profoundly deal with the emotional level of awareness. There are things associated with the suit of cups as it is also popularly known. This includes feelings, love, relationships and connections. If this card appears, it basically represents the display and expression of feelings and emotions as well as the role of such emotions in dealing with other people. Here are different suit of cups and their upright and reversed meanings. In a tarot card reading where there is a predominance of the suit of cards, it is most likely that the client is seeking solutions for issues concerning emotional conflicts. Their main focus is in finding answers to questions involving love matters, relationships and emotions. 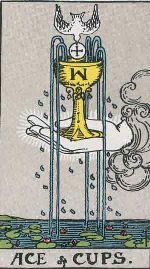 People who are represented by the tarot cups are also humane, creative and connected or deeply attuned with their emotions and feelings. This is also called the Root of the Powers of Water. Its upright divinatory meaning includes fertility, love, joy and faithfulness. It represents the commencement of all positive powers, artistic and creative projects. Its reversed meaning is symbolic of barrenness, despair, failure of love and loss of faith. The Two represents partnership, relationships, attraction and unified love. Its reversed meaning is the lack of harmony, break-up and imbalance in a commitment or relationship. The Three upright meaning is friendship, community, creativity and celebration. Its reversed symbolism is stifled creativity and infidelity or extra-marital affair. The Four represents contemplation, meditation, apathy and re-evaluation but reflects boredom, being aloof and missed opportunity in a reversed position. The Five upright position represents the need to re-assess priorities in life, espousal and union, broken engagements, worries, regrets and emotional let-downs. Its reversed meaning is forgiveness, moving on and acceptance. The Six means nostalgia, innocence, childhood memories and reunion. When reversed, it means unrealistic, naivety and being stuck in the past. The Seven means illusion, fantasy, choices, imagination and wishful thinking. When reversed, it means diversionary tactics and temptation. The Eight means abandonment, disappointment, withdrawal and escapism. It means hopelessness, walking away and aimless drifting when reversed. The Nine when positioned upright means comfort, satisfaction, bliss or happiness and every wish of the wisher fulfilled. When reversed, it means materialism and dissatisfaction as well as greed on materials and immaterial things. The Ten card represent alignment, happiness and harmony in relationship as well as marriage. The reversed position of the card means broken marriage or home and the misalignment or chaos in terms of values. The Page card is a representation of creativity and synchronicity, new beginnings or may also symbolise a messenger. The reversed card positioning is symbolic of the hindrance or obstacles in creative inclination and immaturity in emotions. The Knight upright card position symbolises the “knight in shining armour” and may mean upcoming romance. It also indicates imagination and charm. When reversed, the card is symbolic of jealousy and envy, moodiness and unrealistic tendencies. The Queen represents emotional security when in an upright position. It also means compassion, calmness and intuitive skills. When reversed, it symbolises co-dependency and insecurity or instability when it comes to emotions. The King card means emotional control and balance, generosity and the will to give and share. When in a reversed position, it means moodiness, volatility, impulsive tendencies and unstable state of things. It may also means the tendency to manipulate things or people when it comes to emotions. To speak directly to a Tarot Reader, please click here for a Professional Tarot Reader.